As we all know, the winter of 2015-2016 in Vermont was largely a bust, with (virtually) no snow and generally warm temperatures. The no snow factor would have been concerning if we had extended periods of sub-zero temperatures, but with the exception of February 13-14 when we recorded temperatures of -13-14°F in South Burlington, that deep freeze didn’t come. Thankfully, the warm weather experienced in early March has subsided, and vines are not showing any sign of premature bud break. The extended weather looks to remain relatively cool, but a warmup is expected to begin next week. It’s time to wrap up pruning in Vermont vineyards in the next few weeks. 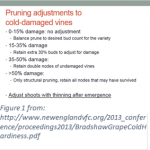 Growers should aim for a balanced vine during pruning, leaving 4-6 buds per foot of canopy. This would be adjusted up in cases of high primary bud mortality from winter cold damage, but damage observed at the UVM vineyard was generally below the 15% threshold where we consider leaving additional buds to compensate for those that were damaged. 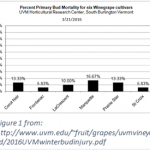 2016 Primary Bud Mortality can be found at: http://www.uvm.edu/~fruit/grapes/uvmvineyard/2016UVMwinterbudinjury.pdf. We encourage growers to collect their own primary bud mortality data prior to pruning, if possible. The procedure is fairly quick and requires no special equipment besides a hand lens or magnifying viewer. A helpful video from the Cornell Cooperative Extension Finger Lakes Grape Program that outlines the process may be found at: https://www.youtube.com/watch?v=_RHJ5mY3fAs . This entry was posted on Wednesday, March 23rd, 2016 at 8:31 am and is filed under Grape. You can follow any responses to this entry through the RSS 2.0 feed. Responses are currently closed, but you can trackback from your own site.